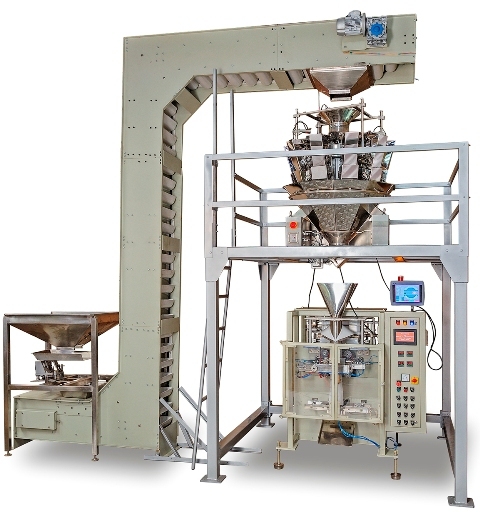 Multihead Weigher Pouch Packaging Machine. This machine automatically forms a pouch, fills it with a product and then seals and then separates the "filled and sealed Pouch". The Multihead Weigher Pouch Packaging Machine is suitable for all kinds of snack Foods, dry fruit etc. This machine can be synchronized with any multi food weighing system and can pack the products in centre sealed pouches. It uses a single roll of Packing film The Machine is fitted with Collar Type Former Pipe unit that; convert flat packing film into vertically sealed tube; which is ultimately converted in to filled & sealed pouches. Horizontal Sealers act like opening & closing jaws to carry out horizontal sealing . Multihead Weigher Pouch Packaging Machine can make Central Sealed Pouches only. The machines requires supply of compressed air. Best weight combinations chosen by scientific computer. Correct calculation by high-precision load cell. Running stability through step motor. material, prevents crushing, and damage.